A catamaran powered exclusively by the sun cast off from Spain’s southeastern coast, starting a journey that is completely free of fossil fuels. Madrid, July 24th, 2010 –A catamaran powered exclusively by the sun cast off from Spain’s southeastern coast, starting a journey that is completely free of fossil fuels. The tired and tested catamaran, the 46ft WWF Solar, which set off on July 14, is part of WWF Spain’s new ‘Embárcate’ (Get on Board) campaign to promote the use of the renewable energies and the conservation of marine ecosystems. The Embárcate campaign will take place along the Mediterranean coastline each summer for the next 3 years. “The WWF Solar is powered completely by the sun. It does not use sails, and it does not use any fossil fuels. It is a boat that causes no polltion – it does not emit any Co2 whatsoever. The Solar shows that we can easily substitute fossil fuels with renewable energy,” said José Luis García Varas, Head of the Marine Program at WWF Spain. The WWF Solar and its crew have already docked in the cities of Águilas, Mazarrón, and Cartagena along Spain’s southeastern coast, bringing with them an arsenal of infomation on endangered Mediterranean habitats and species, as well as tips on the sustainable use of resources in some of the last wildlife bastions along the Spanish shoreline. Staff and volunteers spent the first few days of the voyage accompanying local people and tourists on solar boat trips as well as guided hiking and diving expeditions. The Solar will also visit some of the Mediterranean’s most important costal areas over the next 3 summers, including Marine Protected Areas (MPAs) such as the Cap de Creus Canyon, home to the greatest density of submarine canyons in the Mediterranian Sea. “We can safeguard the Mediterranean region’s biodiversity in a way that benefits both people and the evironment,” said García Varas. “Renewable energy is an important part of this as is raising awarness that there are many other sustainable practices, such as operating small scale fisheries, that make it possible for people and the environment to thrive,” he continued. 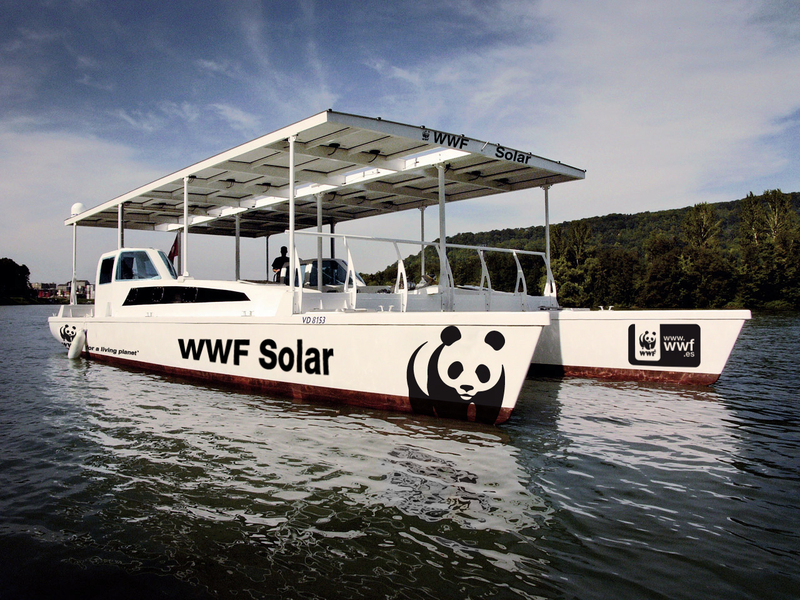 The WWF Solar is fitted with photovoltaic panels that cover its 65m2 roof, which allow the boat to travel at an average speed of 5 knots. When fully charged, the vessels batteries can run its engines for 90 nautical miles, the equivalent of two full nights of sailing or around 18 hours. This is not the first voyage WWF Solar has made. In 2007, a crew of 5 traveled from Basel, Switzerland to New York City in a trip that would set a Guinness World Record by marking the first motorized crossing of the Atlantic Ocean using only renewable energy. Upon the completion of the histortic voyage, the orignal developers of the boat, Swiss association Transatlantic 21, donated it to WWF. The Solar will visit some of the Mediterranean’s most important costal areas over the next 3 summers.